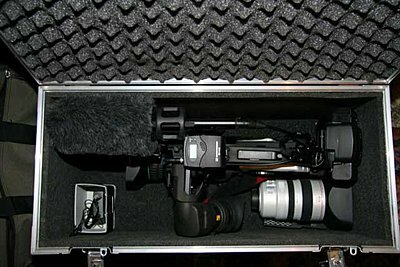 Does anyone have some photos of the inside of the Canon hard case (HC-3200)? I can only find pictures of the outside. I would like to know how well the XL2 is supported in the case. 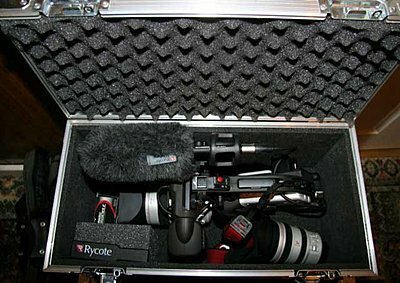 Would a Pelican case be better? Don't know about that case, but if you are living near the "original" Washington, i.e. Tyne and Wear, I know a place in Sedgefield, that makes a great custom made case. Hi Allen, it's http://www.SwanFlight.com Ask for Sean Dodds, the Manager, he did two cases for me a few months ago. Are you going to the I.O.V. Convention later on this month? Thanks Mike, could I ask you what the cases cost (pm or e-mail if you prefer). Sorry, Washington State :) Would you share a picture of your custom case? Hi Luke, here's some pics. There's foam supporting the lens, it doesn't show in the pics, but the cameras are well cared for in the case. There's room for all the other sort of bits and pieces, you need to take with you on a shoot. Thank you very much for sharing the pictures. The cases look very nice and sturdy. I'm sure I could find someone in the US to make such a case when I need one. I'm sure you'll have no trouble, they make them for Disco gear to be carried about in. Get the Pelican with the fitted foam. 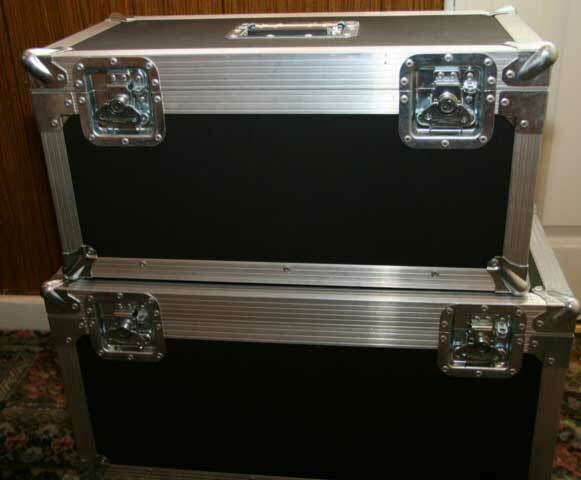 MUCH better than the hard case. Pelican might be better quality-wise, but the portabrace was cheaper. Depends on the budget. Both can be ordered with custom-cut foam to fit the XL2. My boss bought the big Canon hard case (in January before I started working at my job) and it's sat next to my desk ever since. I don't use it, because I keep the camera in a Portabrace soft-case. If you REALLY want one, I will sell you mine discounted. Seriously. I'll post some pics when I get to work tomorrow. It's 9 months old and never been used. I probably should have said, I do all my work within a 50 mile radius of my home, so It's a case of putting everything I need for the job, in the car boot/trunk, and being able to shoot straight on arrival. If I was going on a plane, God forbid, I would use a foam protected case. It's a case of "horses for courses"
OK, so I'm recalling my post on the Portabrace. NOT happy with them. Ordered a hard case (from my earlier post) 3 weeks ago, and it STILL isn't here. Ordered it through an A/V company here in town and they were having trouble even getting a hold of anyone at Portabrace for answers. I paid for 2nd day shipping (no help, since it isn't here). Finally got a hold of them yesterday. The case is still in the warehouse! They also said someone put down ground shipping on the invoice, so if I wanted 2nd day, I'd have to pay extra. WTF!?!?! If I was still going to get that case, PORTABRACE is going to pay for the shipping...I mean, it's 3 WEEKS LATE! Anyway, had my guy at the A/V company drop the order and go with Pelican instead. Should be here tomorrow! 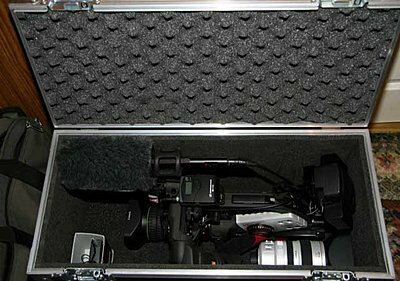 The pelican cases are built like tanks and are well worth the money. I don't think you could destroy one if you tried. Ya, and apparently they have a lifetime warranty that if you break it, they'll replace it. Don't know if that goes for the contents as well, but that would be pretty cool.